Walt Disney World has announced a “signature” frozen drink that will be offered to guests visiting Gaston’s Tavern when it opens in New Fantasyland later this year. The non-alcoholic drink is called LeFou’s Brew and is likely to give Universal Orlando’s incredibly popular Butterbeer a run for tourists’ money. LeFou’s Brew is named for Gaston’s sidekick from “Beauty and the Beast” and will instantly be recognizable to anyone who has visited the Cozy Cone in Cars Land at Disney California Adventure. The drink is identical Red’s Apple Freeze, but with a new twist. It features frozen apple juice with flavors of toasted marshmallow and a generous squirt of passion fruit-mango foam on top. And it will be served in souvenir steins and goblets, pictured above. 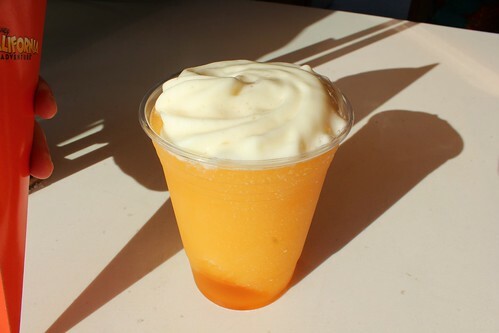 While the flavor profile is completely different than that of the popular Butterbeer drink from Universal’s Wizarding World of Harry Potter, the process for serving the beverage is quite similar, with a frozen drink on the bottom and a sweet foamy topping. Cinnamon rolls will also be served at Gaston’s Tavern, which will open with most of New Fantasyland on November 19 (with a grand opening scheduled for December 6). Smart move. Red’s Apple Freeze is great and, sadly, not many people seem to have discovered it. Nice to hear it’ll be available on both coasts. I am a little taken aback by the souvenir mugs. In the image, I am struck by how cheap they look – low quality plastic cups with stickers affixed to them. I am assuming that there is a logo or logotype for Gaston’s Tavern. That would be more appropriate on the mugs – even though this is Fantasyland. These look like cheap character cups you would by at Walmart. Contrast them to the souvenir butterbeer mug. Yes, they are just plastic cups, but have a more substantial look and feel and have better placemaking in the image on them. They would look pretty hokey with an image of Harry Potter or Hermione on them even though Wizarding World is a character driven, themed land. I hope the Disney mugs are of better quality than that image suggests. You’re right. A Gaston’s Tavern logo would be far better than a character mug like this. This screams tourist souvenir rather than owning a piece of a magical place. But… that’s exactly why Disney did not create the Wizarding World. They passed on JK Rowling’s strict guidelines and supervision, requiring that small details like this fit the world without plastering branding or characters on everything. That’s not Disney’s style. They push their characters like no one else and it all sells very well. Kids will love these mugs but I doubt adults will want them as much as they’re proud to have an official Butterbeer mug. Unfortunately, neither of the two (or Harry Gaston) are applicable for adult audiences :o( After all we have to remember that it is not good to associate beer with entertaining characters. Disney Parks Blog just released images of pins for New Fantasyland. There is one for Gaston’s Tavern and his image is on it. Putting this (not the pin, but a similar decoration) would have made this a much more appealing item. That assumes that it was not a sticker and the plastic mug itself is better quality than the image above implies…. I agree Ed! A glass mug with an image like the Gaston’s Tavern Pin, I’d buy for sure! Are you kidding? I would freaking love to get this Gaston-mug.The guy’s a memetic GOD online. After all, NO ONE sells merchandise like GASTON! Do you think that the kids will like the mugs/beverage, or will they be pick up on the fact that these aren’t hand-thrown ceramic mugs that are so critical to the success of the cartoon? Sure hope they don’t plan on giving us plastic forks to eat with. Plastic utensils would have no place in a quick service restaurant based on a fictional tavern from a kid’s cartoon. I’m wondering if Disney will offer $0.99 refills in these mugs the way Universal does with the Butterbeer mugs. I just got back from a Universal/Disney trip last night and the inexpensive refill for those mugs makes them worthwile to invest in. My girls each had about three refills of the Butterbeer, and then my husband was able to use it for soda. I think everyone else made some great points about how cheap the Disney mugs look compared to the Butterbeer (I’m the proud owner of two of them!) mugs.